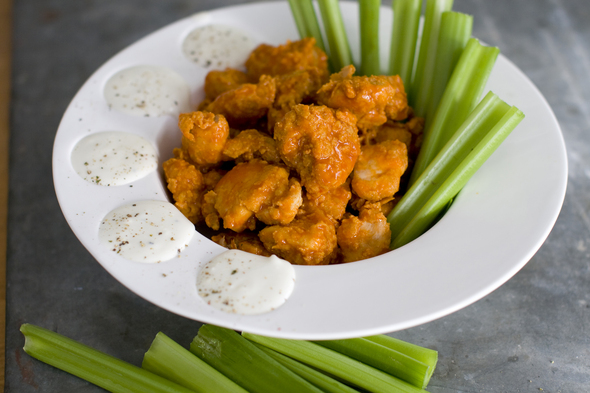 Posted on Sat, Jan 21, 2012 : 7:11 a.m.
DiSpirito's recipe for popcorn chicken puts a delicious, low-calorie spin on a game day favorite, chicken wings. The big game on Super Bowl Sunday usually brings with it big eats. As a nation, in just one day we consume millions of pounds of potato chips, tortilla chips, pretzels, popcorn and nuts. And don't even get me started on the guacamole, chicken wings, baby back ribs, pizza, dips, chili and subs. But a few smart choices can have you enjoying Super Bowl-style snacks without doing quite so much damage to your New Year's resolutions. My buffalo popcorn chicken is a good example. It puts a delicious, low-calorie spin on a game day favorite — chicken wings. Typical wings rack up 549 calories and 30 grams of fat per serving (you'd have to do the wave about 2,000 times to burn those off). My version has just 264 calories and 14 grams of fat per serving. Traditionally, chicken wings are deep-fried. Combine that with the usual blue cheese dip accompaniment, and you have a caloric nightmare. Mine are served with low-fat blue cheese dressing, and I swear you won't taste the difference. To reduce fat and calories, I use my flash-frying method, which is easy to master. Starting with skinless chicken thighs, I microwave the thighs until cooked through. Microwaving the chicken first means it doesn't need to sit in the oil for nearly as long. Next, they are dunked in low-fat egg white, then dredged through a blend of whole-wheat flour and cornmeal. After that, the frying takes just 12 seconds. Traditional methods call for 10 to 15 minutes. By cooking the chicken before it hits the oil, it needs little time in the oil. And that means it absorbs very little of it. Nothing goes better with wings — or in this case, thighs — than beer. But drink a few brews and you'll have to climb the stadium steps for an hour to burn them off. Instead, consider serving low-calorie beers at your party. There are some great ones out there. As for the rest of your Super Bowl offerings, don't be afraid to serve vegetables and fruit with low-fat and low-sodium dips, and other creative low-cal foods. With some thoughtful planning and delicious dishes, you'll be sure to score with food and football fans alike. — Omit the blue cheese dressing to save an additional 35 calories per portion. — Make sure your oil thermometer is used exactly as the manufacturer directs. Carefully monitor the temperature of the oil every 5 minutes so it does not exceed 400 F.
— When cooking the chicken in the microwave, keep in mind that the pieces on the outer rim of the plate will cook faster than those in the middle. So when you flip them over, be sure to rotate the pieces from the outside of the plate to the middle before you continue to microwave. — Let the oil cool on the stove until it is room temperature, then use a funnel to pour it back into its original container for easy disposal. In a large, heavy pot over medium, heat the oil to 400 F. Use a thermometer to monitor the oil temperature. Meanwhile, cut each chicken thigh into 4 to 5 even chunks. Season the chunks on all sides with salt and pepper, then arrange them on a microwave-safe plate. Microwave on high for 1 1/2 minutes. Flip the chicken pieces and move those on the outer edge of the plate to the center and vice versa. Microwave on high again until the chunks are just cooked through, about another 1 1/2 to 2 minutes depending on your microwave. Let the chicken cool to room temperature. While the chicken cools, in a medium bowl beat the egg whites until foamy, about 2 minutes. In a separate large bowl, mix the cornmeal and flour, then season with salt and pepper. Submerge the cooked chicken pieces in the egg whites and toss to coat well, then move the chicken to the bowl with the cornmeal mix. Toss the chicken to coat well. Working in about 4 batches, add the chicken pieces to the hot oil and fry for 12 seconds. Use a slotted spoon to transfer the fried chicken to a plate lined with paper towels to drain excess oil. While still hot, place the chicken in a large bowl, add the buffalo sauce and toss to coat well. Serve the chicken with celery and blue cheese dressing for dipping. Nutrition information per serving (values are rounded to the nearest whole number): 264 calories; 14 g fat (2 g saturated); 75 mg cholesterol; 13 g carbohydrate; 27 g protein; 3 g fiber; 747 mg sodium.